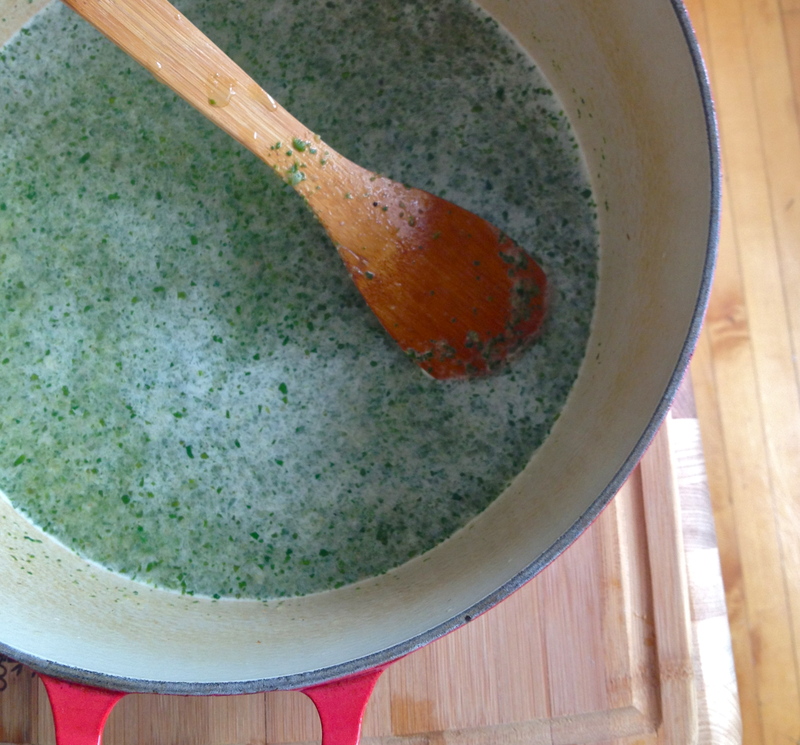 Spinach and Green Garlic Soup. Green garlic is everywhere right now. It’s just young garlic, with a softer, edible skin and a milder flavor. 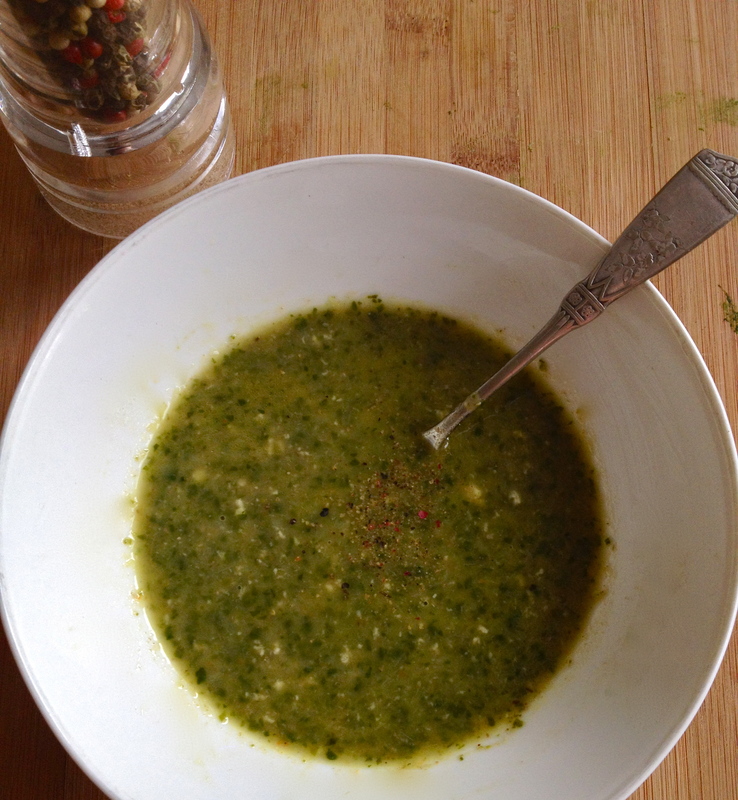 It’s delicious in scrambled eggs, soups, and sauces (especially pesto). Since I haven’t been feeling well lately, from a combination of allergies and a sore throat from screaming my head off when the Blackhawks beat the Red Wings in a Game 7 of the NHL playoffs, I figured a nice spring soup might perk me up a bit. It’s also a great way to get a good healthy helping of spinach! 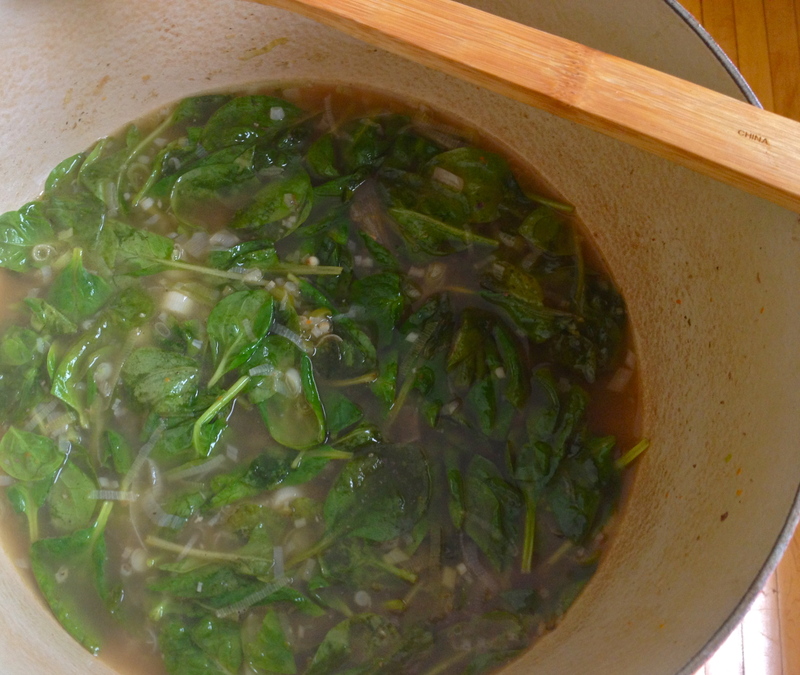 Adapted from Orangette, this light and easy green garlic and spinach soup is a breeze to make and delicious to boot. Dig in. In a Dutch oven or other large pot, heat a bit of butter and olive oil over medium low. The butter is for flavor, and the olive oil will keep the butter from burning. 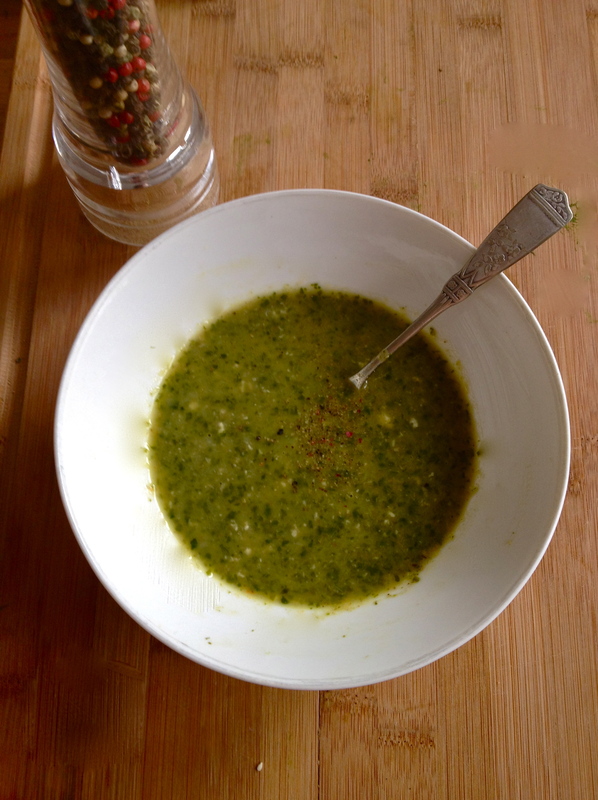 Once it’s hot, add the green garlic, salt, and cayenne. Cook gently, careful to avoid burning or browning, until the garlic is soft and smells sweet, and has lost its raw smell. Add the chicken stock and turn up the heat. Bring to a boil, and then turn down to simmer for 15 minutes. Add the spinach and turn off the heat. 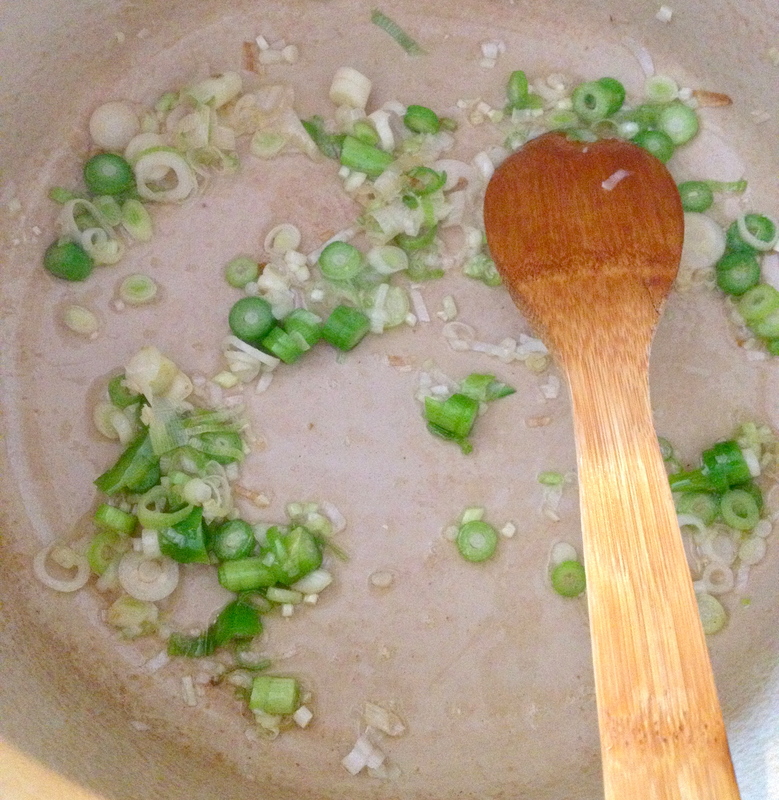 Stir it in and let stand just 5 min, so it cooks but keeps its bright green color. Now puree the soup in batches, until it’s smooth. Add it back to the pot to reheat. I wanted to reduce my soup and get it to a little bit thicker consistency, so I simmered it a few minutes more. Once it’s where you want it, turn off the heat and stir in a scoop of greek yogurt. Serve immediately, with lots of pepper on top. Delish! Previous Steamed Artichoke with Harissa Butter. Next Harissa Grilled Pork Chops. That looks like a seriously restorative bowl of soup. I don’t think I’ve ever made a puréed soup based just on spinach, but it’s a terrific idea! Garlic is a known healer, so I sure hope you are feeling better!! Oh good! Garlic is magical – self-medicating in the best possible way.